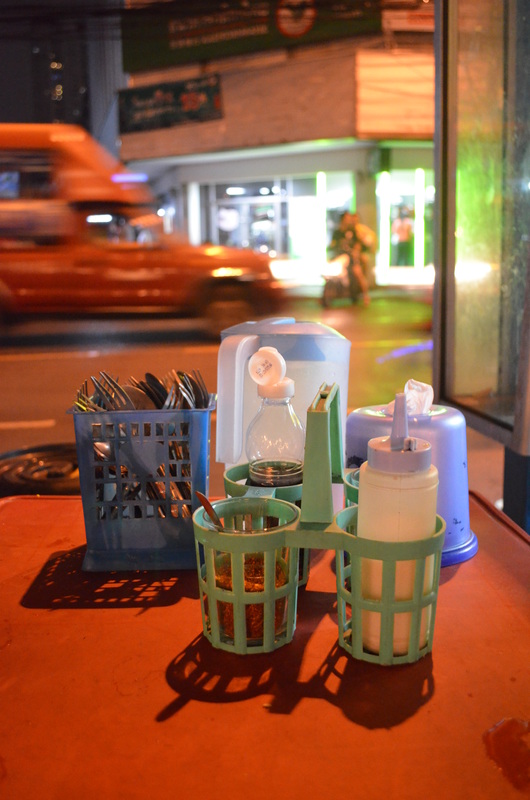 There’s something uniquely great about Thai street food, made with unpretentious means (often on the border between simplicity and ambiguous sanitation), quaffed down by the side of the road in whatever weather comes your way, cars and scooters and pedestrians streaming by your plastic chair beside a fold-out table. 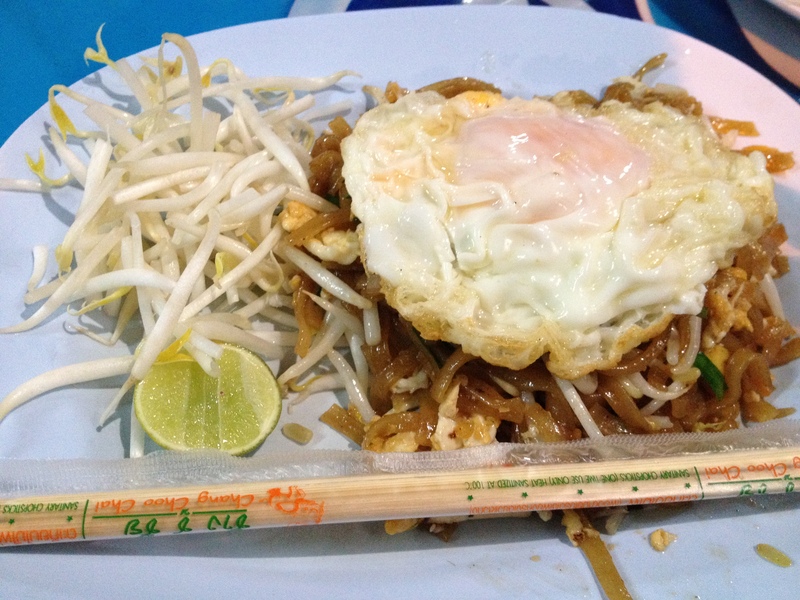 Here we were in Bangkok, having just taken an hour-long water taxi ride up and down the Chao Praya River, now having wandered along Thanon Charoen Krung south of the Taksin BTS station, and stumbled upon a busy pad thai stall right next to a noodle stand. As we sat waiting at the first stall for our pad thai, it began to drizzle, and the vendors along the entire street dragged out tarps just as it started pouring, so we sat huddled under a wobbly canopy umbrella wolfing down two plates of freshly made pad thai, trying unsuccessfully not to get rain-soaked. 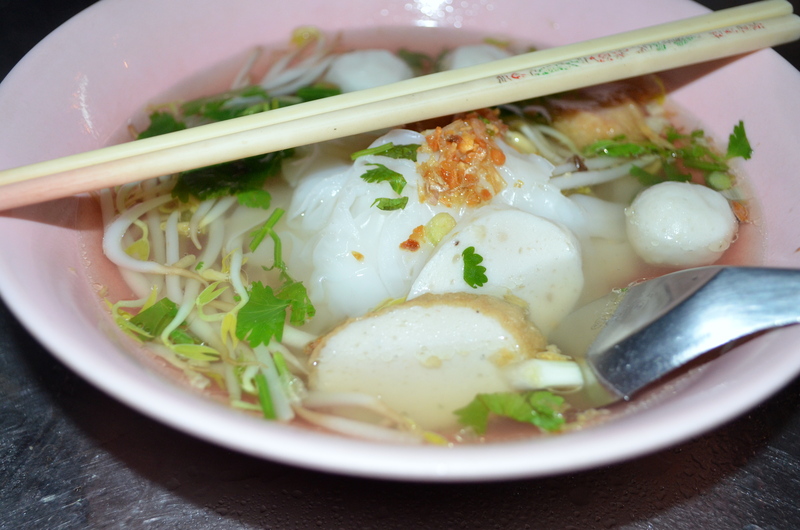 Then, damp and chilly, we moved down the street to the next stall for some kway teow noodle soup with fish balls. 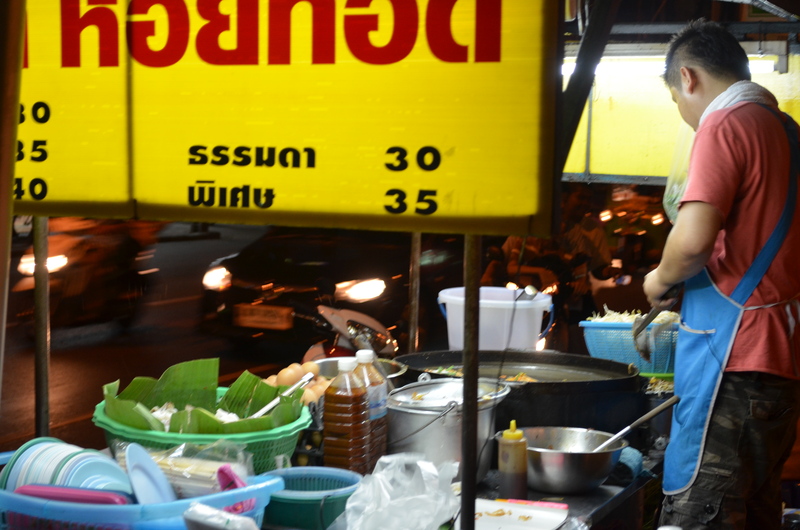 It was just pad thai and kway teow noodle soup – nothing odd, nothing crazy, nothing I hadn’t had before in countless restaurants back home. 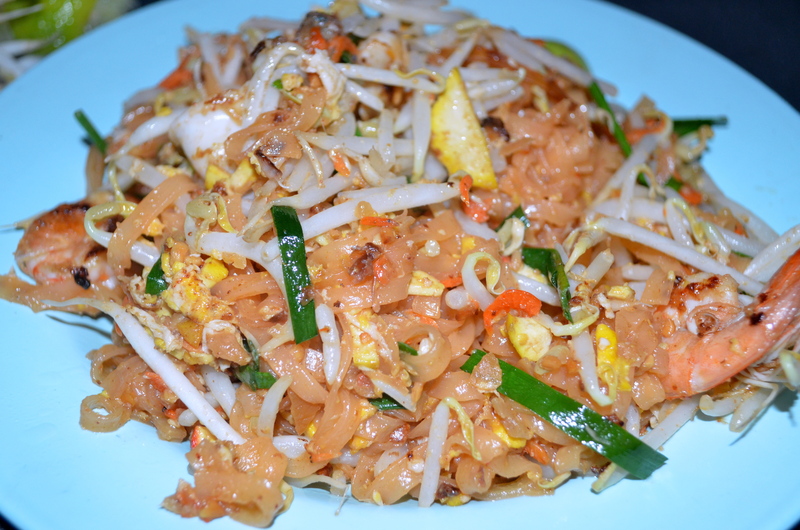 But they were still as delicious as, if not more so than, any versions of either dish that I’ve ever had – the pad thai noodles perfectly flavored and soft enough to soak in the juice from the wedge of lime, the soup steaming hot, rich, and spicy. 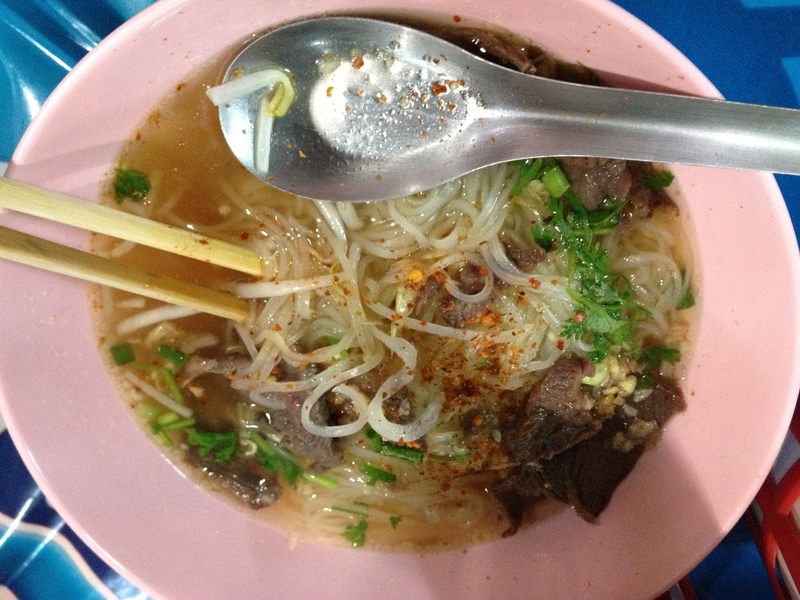 On top of that: the surrealism of being in Bangkok on a Tuesday night in late August, chowing on street food at a rickety table on a drenched sidewalk under a sprawling tarp next to a stall of bubbling broth and piles of rice noodles. It was hard to shake the smile from my face and the spreading warmth of happiness that could also have well been because of the noodle soup. 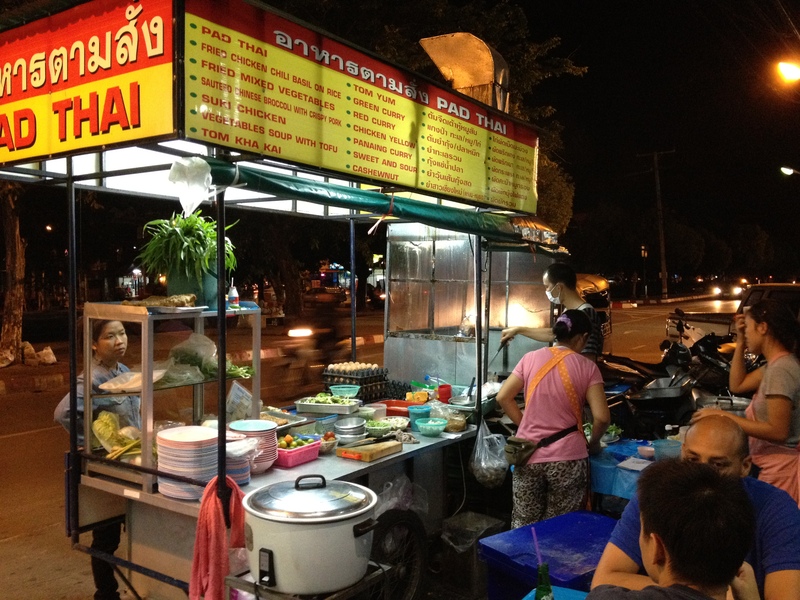 When we moved onto Chiang Mai a few days later, and needed a quick bite before touristing it up at a weeknight Muay Thai fight (where we unsurprisingly lost 600 baht of wagers and also had to buy our effeminate Thai bookie a large Singha beer), we also ended up on a street corner lined with food stalls. I’ll admit that my street food experience is a bit colored by my romanticizing of street food and it being my first time in Thailand, but however you slice it, this food was marvelously delicious. I already itching to get back and have more time to dive further into the richness of local cooking. The noodle soup with marinated beef looks so yummy I could eat it off my computer screen! Missing authentic South East Asian food alot as I’m a Singaporean based in Buenos Aires, Argentina! Lovely pictures!